In the fall and winter I provide leaf and landscape bed cleanup services. On the leaf cleanup, I blow the leaves away from your home and from around your landscape beds. The leaves are then bagged and removed. Dead plant growth in the landscape beds are removed and a basic fertilizer is applied for landscape plants. Although top growth on most plants begins to slow in early fall, the fall fertilizer actually helps stimulate important root growth. Roots continue taking up nutrients from the soil throughout the fall until the soil temperatures drop low enough to inhibit root function. This improved root development improves the plants ability to withstand winter stresses and be ready to next year's growing season. 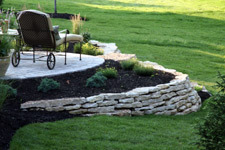 I can make landscape improvements such as installing paver stone sidewalks & patios, landscape beds, rock work and other yard enhancement projects including water features. Call me today and request your FREE landscape estimate.